Has this happened to you? Something comes up last minute: maybe an opportunity to go fishing with a friend, or a short-notice invitation to go on a camping trip. People are waiting for you. And the stuff you need – fishing rod, backpack, sleeping bag – is in your garage. You just need to grab it and go. There’s only one problem: you have to ‘find’ before you can ‘grab.’ And you can’t find. Bummer. Maybe your friends will wait, and maybe they won’t. But one thing’s for sure: your ‘fun’ activity is starting out as a real pain in the… garage. Of course, that same scenario can be replayed in many variations. Maybe you’ve finally talked yourself into doing that hedge trimming you’ve been putting off for ages. So, all psyched-up, ready for action, and eager to get the chore underway and over with, you march into your garage, grab the hedge clipper, and…um…let’s see…grab the hedge clipper, grab the hedge clipper, grab the hedge clipper…where IS the miserable thing!? There’s nothing that kicks a bad attitude into high-gear like having to hunt for something before you can even get started with an unpleasant job. (Those poor hedges are going to be trembling in terror when you finally come at them, long-lost clipper in hand and anger in your eyes!). 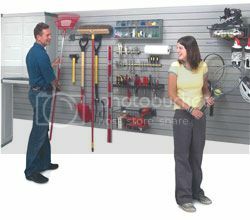 There’s a wonderful garage storage system that can transform the above scenarios into problems that other people have, not you. It’s the storeWALL system of wall-mounted storage attachments. And it’s an ideal system for garage storage. You then attach any combination of hooks, baskets, shelves, bins or totes to the storeWALL panels. Mount as many or as few storage attachments as you wish. Position them on the wall in whatever pattern you desire (the options are virtually infinite). Mounting the storage attachments to the wall is fast and easy. That’s because of the patented CamLok mechanism that’s used to attach the storage attachments to the paneling. Just a simple twist of the CamLok secures the storage attachment to the wall paneling. No need for drilling holes or driving screws every time you want to install a storage attachment. And just a simple twist unlocks the storage attachment for removal or repositioning. Mount storeWALL panels on your garage interior walls, and you’ll have a MASSIVE amount of storage space available to you. And every item stored using the storeWALL system will be off the floor, easy to organize, easy to find. You’ll be able to put your hands on anything you need quickly and easily. Procrastination may continue to be a way of life – as it is for so many of us – but NOT because you can’t find what you need. This entry was posted on Wednesday, June 26th, 2013	at 8:00 am	. You can follow any responses to this entry through the RSS 2.0 feed. Both comments and pings are currently closed.